Warren Earl Burger, 1907-1995. Chief Justice of the United States, 1969-1986. 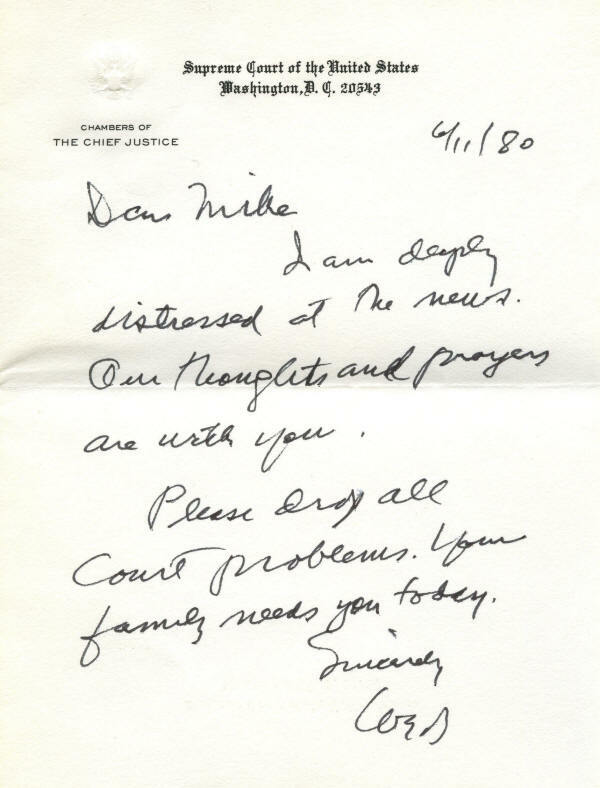 Rare Autograph Letter Signed, WEB, one page, 5¾” x 7¾", with integral leaf attached, on engraved stationery of the Supreme Court of the United States, Chambers of The Chief Justice, Washington, D.C., June 11, 1980. With original envelope addressed in Burger's hand, “Mr. Rodak / Personal." 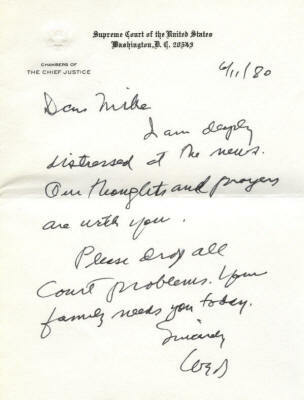 This is an exceptional letter in which Burger conveys his condolences to the Clerk of the Supreme Court, Michael Rodak, Jr., on the death of his father. It shows Burger both personally and in his role as the Court's administrator. He writes, in full: “I am deeply distressed at the news. Our thoughts and prayers are with you. / Please drop all Court problems. Your family needs you today." This letter is doubly desirable. First, Burger is rare in autograph letters signed. Our research has disclosed only three others sold at auction since 1977. Second, internal Court correspondence rarely appears on the market. Burger has boldly penned this letter with a black felt-tipped pen.  The letter is in very fine condition and, absent the single fold, would be extra fine. The accompanying envelope is slightly soiled and has, of course, been opened, but it was barely sealed, and some of the gum is still on the flap. It is in very fine condition as well.